Growing a healthy crop in a greenhouse is all about monitoring variables. This usually brings to mind temperature, humidity, pH, nutrients and light. One variable that gets overlooked is dissolved oxygen (DO). In three separate case studies an ardent strawberry grower, a hydroponic produce grower and an undergraduate at a major university in the U.S. experimented with adding dissolved oxygen to irrigation water via a process called electrolysis. They used O2Grow’s nanobubble technology from a company called Oxygen Research Group to increase dissolved oxygen to their watering regimen. With the O2Grow system, tiny molecules of hydrogen and oxygen are separated from the water through electrolysis, raising the DO in the water 50% higher than traditional methods. "This technology will oxygenate from 40L up to 1000L at a time, which is ideal for a smaller grow or a propagation room", the team with O2Grow explains. Dennis Clark, president of the Oxygen Research Group LLC, says you can have 2mg/L of dissolved oxygen coming out of a well and with a bubbler the best you can get is up to 8mg/L. "Which is better than nothing, but research has proven that if you can get higher levels of dissolved oxygen, you can get better yields." “But what if you got 12mg/L,” he continues. “That’s when you start to notice the difference.” This can be achieved with the nanobubble technology available from O2Grow. Erik Gundacker, a former computer engineer and now owner of Scenic Valley Farms based in Rosemount, Minnesota, grows organic strawberries in stackable pots in high tunnel structures. He provides local markets with fresh strawberries 8 months out of the year, something that heretofore was unheard of in this part of the world. Last year he added the system to his irrigation tank and ran it through the drip lines, growing 5 different varieties of strawberries, 6 stacks, with 50 plants per stack, all grown in soil. He found an increase in yields in all but one of the varieties. He says this year he’ll be growing four times as many berries using the system, which he thinks will give him a more representative sampling. Gundacker is confident that the system will deliver. 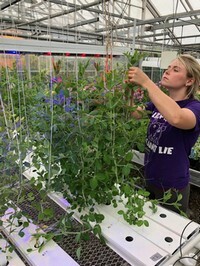 In a university study, undergrad Taylor North, under the direction of Sonja Maki, PhD and Assistant Professor in the Department of Plant and Earth Sciences at the University of Wisconsin-River Falls, achieved significantly better root development using the O2Grow system to add DO in a study growing crown peas. “Overall it was wonderful, the electrolysis works phenomenal”, says North, whose body of research on the crown pea and electrolysis was accepted and will be presented at a conference at Kennesaw State University in Georgia. While initially doing research on using DO to help control biofilm, Dion Graber, owner of Microfarms, LLC in Indiana noticed a marked difference in yields out of his produce. He’s gone all in, using O2Grow’s largest oxygenator, the O2Grow-2250 to add DO to his irrigation tank for all of his plants. The market farmer, who provides fresh produce to local markets, says he’s seen an increase of 40% in tomato production, 50% in cucumbers and 60% in peppers. He says they’re also experiencing earlier harvests of lettuce (5-6 days earlier) out of their hydroponic system.